For people in hurry get the code from Github. Central Authorization Service (CAS) is a Single Signon application used to authenticate and authorize an application for centralized user access control. Jasig is an opensource CAS application. In order for Jasig to work we need to enable SSL. Enter login/password as user1@example.com/user1. You will get the access to your events. When you log out, it will again redirect to Jasig logout page. may go against a database or LDAP server. The id should remain "attributeRepository" though. 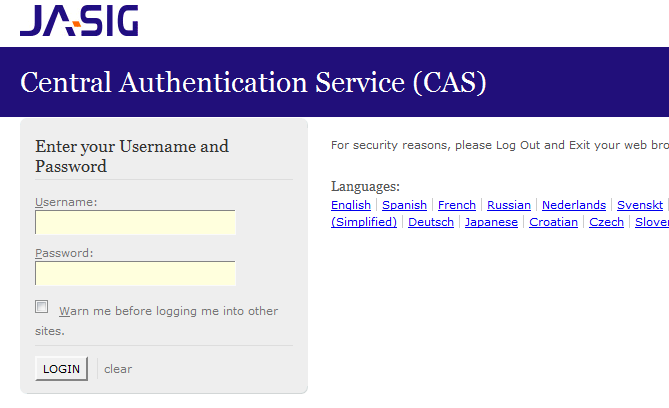 Refer src\main\webapp\WEB-INF\spring\security-cas.xml file for more details on casAuthProvider bean definition. This entry was posted in Spring Security and tagged Spring Security on February 11, 2013 by Krishna. In continuation of my earlier blog on spring-test-mvc junit testing Spring Security layer with InMemoryDaoImpl, in this blog I will discuss how to use achieve method level access control. Please follow the steps in this blog to setup spring-test-mvc and run the below test case. If you notice, if the user did not login or if the user is trying to access another users information it will throw an exception. The PreAuthorize only works on interface so that any implementation that implements this interface has this access control. I hope this blog helps you. In my next blog I will explain how you integrate Spring Security with Central Authorization Service (CAS) Single Sign On. In continuation of my earlier blog on spring-test-mvc junit testing Spring Security layer with InMemoryDaoImpl, in this blog I will discuss how to use Spring Security’s LDAP integration. I hope this blog helped. In my next blog I will be explaining how to integrate Spring Security with Method level access control. In continuation of my earlier blog on spring-test-mvc junit testing Spring Security layer with InMemoryDaoImpl, in this blog I will discuss how to use Spring Security’s JdbcDaoImpl class. Below is the JDBC configuration to identify the user and his role/authorization to access. users-by-username-query="select email,password,true from calendar_users where email = ?" I hope this blog helped you. In my next blog, I will demo how to use LDAP for Securing an application. For people in hurry here is the code sample and the steps to setup the code. Spring Security 3.1 is a framework that supports authentication and authorization in Java. Spring MVC has a good integration with Spring Security. In this blog, I will demonstrate how to JUnit test Spring Security layer for a Spring MVC application using spring-test-mvc. The usecase we use in this blog is a Spring MVC based calendar application, where user can login and enter his events his events. User can see other user events but he cannot change it. An admin user can see other user’s Events as well as change it. In my next blog I will be introducing Jdbc implementation of authorization. This entry was posted in Spring Security and tagged Spring Security on February 10, 2013 by Krishna. This is one way to debug it, but there might be few other ways. Please suggest me. This entry was posted in Spring and tagged Spring Security on January 8, 2013 by Krishna. Authentication is a way to provide user identity so that the application identifies who logged into the system. Authorization is a way to tell who can access which part of the application. A simple Realm is Tomcat’s MemoryRealm and it depends on tomcat-users.xml to configure the users, in reality we use LDAP or any database to store user information. A simple Authentication Provider looks as below, and it is not specific to a container. Again in reality the user information will be in LDAP or Database. In spring we can achieve Authorization as below, in the spring-security context. The authorization in Container based Security is limited to virtual folder within the container. But with Spring Security we can provide regular expression and secure portions of application. Spring also extends security further to Service layer using a technique called ACL, refer Spring Security document. If you notice for simple authentication/authorization capabilities container based security is enough, but for more complex enterprise service level security, it make sense to consider Spring Security. I hope this blog helped. This entry was posted in Java and tagged Spring Security on December 11, 2012 by Krishna.